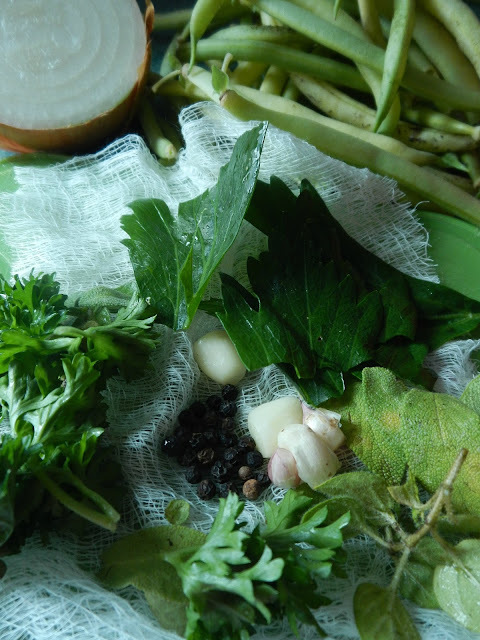 Several years ago when I first began using my copy of The Joy of Cooking, I wanted to make homemade chicken stock and one of the things the recipe called for was a bouquet garni. I had never bought or used cheesecloth before so instead I added my aromatics(herbs, garlic, peppercorns) in by the handfuls and fished them out at the end. But on a recent and irregular trip to the local dollar store, I spotted a package of cheesecloth and was determined to use it for all those necessary projects that called for it. Yesterday was cool and cloudy, and I was busy running errands and retrieving Shane from work at suppertime, so I grabbed the lonely crockpot, threw in some chicken legs and broth and headed to the garden to round up my herbs and celery. 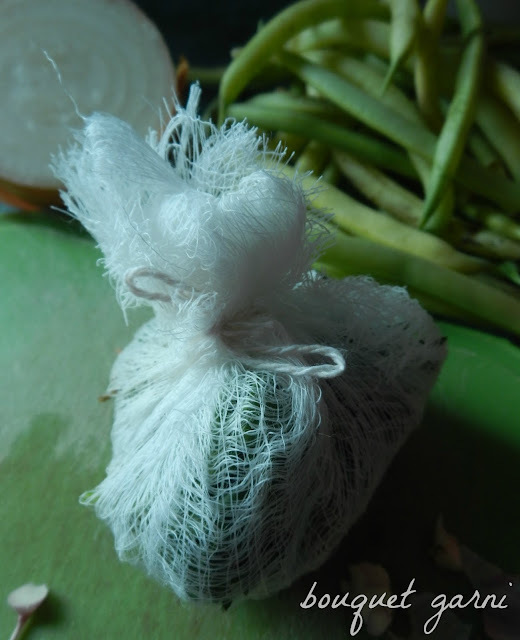 A few minutes later, I had assembled all the ingredients(celery leaves, sage, oregano, parsley, garlic, and peppercorns), I used my fabric shears to cut of a small rectangular piece of cheesecloth and then laid everything inside it and tied the little bundle together with some white string. I dropped it into the broth amongst the celery and onion pieces and wished it well. It was only later when I checked the cookbook version that I realized I had omitted the bay leaves, so they went in by themselves. Straining the broth was much easier with my little peppercorns safely snuggled into the cheesecloth. A quick tamping down on the strainer and the excess juices ran out of the onion, celery and bouquet garni. What a novel idea. Now, what next can I do with my cheesecloth? Doesn't everyone store their homegrown garlic in a Hello Kitty party cup? ps- I replied to your comments on my blog! my mom used to do drawer sachets and bath soaks in cheese cloth... lavender and mint and things like that- I still do oatmeal "bombs" for the kids tub in the winter, when their skin is itch and dry. You just scoop some into a square of cloth and then you have to tie them up tight with a hair elastic. They're fun, you can squeeze the oatmeal milk out and throw them at each other... maybe that is just the boys.